Procam International, pioneers of distance running events in India, today announced the opening of registrations for the Tata Mumbai Marathon 2019, beginning 29th July 2018. The Tata Mumbai Marathon is jointly sponsored by the Tata Sons and Tata Consultancy Services. The USD 405,000 IAAF Silver Label event will be celebrating its 16th edition in keeping its date with runners in the Maximum City on Sunday 20th January 2019. Given the euphoric rise in the running community in the country, for the 2019 edition, a total of 46,000 running places will be up for grabs across six different categories. As a forerunner to Asia’s most prestigious marathon, the first citizen of the state, His Excellency, the Governor of Maharashtra Shri. CH. 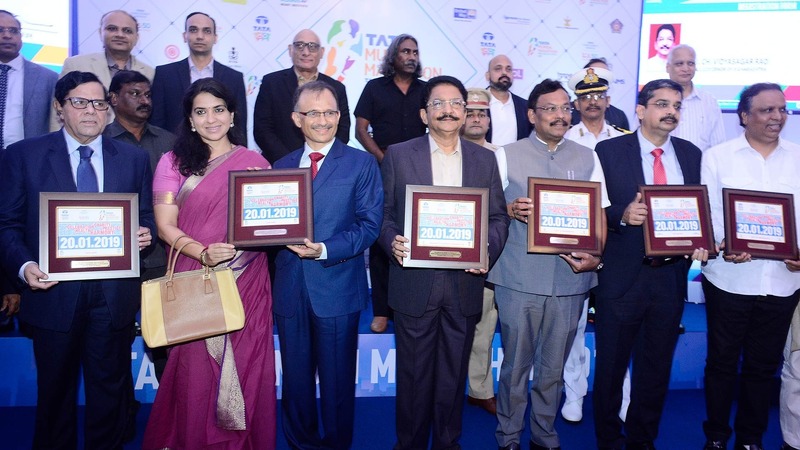 Vidyasagar Rao welcomed Tata Sons, Tata Consultancy Services, event partners and stake holders, to the majestic environs of the Raj Bhavan and launched registrations for the Full Marathon category of the Tata Mumbai Marathon 2019. #BeBetter: Tata Mumbai Marathon has always been about the Possible Dream. The event has consistently encouraged individuals to tap their true potential and push themselves to be the best version of themselves – be it towards a personal goal, or philanthropy. The event ethos #BeBetter will carry this vision forward. Pradipta Bagchi, Group Chief Communications Officer, Tata Sons said, “We saw a phenomenal success in the first edition of Tata Mumbai Marathon 2018 and are confident that this year too people will come together in large numbers for the biggest sporting race in India. Marathons are the epitome of participative sports and stand as a true test of human spirit, physical prowess, tenacity and perseverance much like the Tata group’s journey over the last 150 years. Inclusion of the race in this global ranking system ensures full marathon participants at the Tata Mumbai Marathon an opportunity to be a part of the world ranking system and be ranked in their respective age group globally. It also extends a chance for the top-ranked age group athletes to qualify and participate in the AbbottWMM Wanda Age Group World Championship in 2020. First qualifying period is 16 September 2018 and will end on 29 September 2019. Full Marathon participants in an AbbottWMM Wanda Age Group World Ranking qualifying race will earn points according to their age, time and gender, aligned with the following age groups for men and women: 40-44, 45-49, 50-54, 55-59, 60-64, 65-69, 70-74, 75-79, 80+. Registrations for the feature race of Full Marathon will commence on Sunday 29th July at 0700 hrs and stay open until, 1900 hrs on 30th November 2018 or till running places are filled, whichever is earlier. Registrations for the most popular category of Half Marathon will open on Thursday, 2nd August 2018 at 0700 hrs and close at 1900 hrs on Friday, 17th August 2018 or till running places are filled, whichever is earlier. With an aim to encourage many more to take up to the magic of distance running, this year, the 10K category is open for all amateurs including non-charity runners. Registrations will start on Monday, 20th August 2018 at 0700 hrs and close at 1900 hrs on Saturday, 8th September 2018 or till running places are filled, whichever is earlier. Applicants can apply under timing criteria by submitting their valid timing certificate, if the applicant cannot produce the timing certificate the application will be accepted under general category. A kaleidoscope of colours - the Dream Run registrations will open on Monday, 27th August 2018, at 0700 hrs and close at 1900 hrs on Friday, 31st August 2018 or till running places are filled, whichever is earlier. Always credited for being an inclusive race, the Senior Citizens’ Run and Champions with Disability will open on Saturday, 1st September 2018 at 0700 hrs and close at 1900 hrs on Saturday, 8th September 2018, or till running places are filled, whichever is earlier. Over the years, the Tata Mumbai Marathon has successfully galvanized women of this country and encouraged them to own the streets of Mumbai. Each passing year has given rise to a new breed of quality women runners and to continue this trend forward, there is special criteria for the women participants. Open 10K run: For all the women participants, who do not have a timing certificate and are eager to join the running contingent, a limited number of running places are reserved for them. Half marathon(Timed runner only): A limited number of running places are reserved for women applicants in the half marathon category, who will need to submit a timing certificate to receive confirmation. Applications under this criterion will be accepted until 30th November 2018 or till running places are filled, whichever is earlier. Full Marathon runners will be prioritized in four-line up sections on race day as per the timing certificate submitted along with their applications - under 4 hours 13 minutes; 4 hours 13 minutes to under 4 hours 55 minutes; 4 hours 55 minutes to under 5 hours 37 minutes; and 5 hours 37 minutes and above. The Half Marathonwill be prioritized in seven-line up sections on race day as per their timing certificates submitted during registration - under 1 hour 25 minutes; 1 hour 25 minutes to under 1 hour 46 minutes; 1 hour 46 minutes to under 2 hours 7 minutes; 2 hours 7 minutes to under 2 hours 28 minutes; 2 hours 28 minutes to under 2 hours 49 minutes; 2 hours 49 minutes to under 3 hours 10 minutes and 3 hours 10 minutes and above. The Open 10K Runwill be prioritized in four- line up sections on race day as per their timing certificates submitted during registration - under 1 hour; 1 hour to under 1 hour 10 minutes; 1 hour 10 minutes to under 1 hour 20 minutes and 1 hour 20 minutes and above. This section will also include those participating without timing certificates. Duly filled entry forms with the requisite entry fee can be mailed to P.O. Box No. 11017, Marine Lines Post Office, Mumbai - 400 020. Mumbai residents can also deposit their application forms with the requisite application fees at select Asics stores and select Selection Centre Sports stores, details of which are available on the event website. Tata Group, a global enterprise with combined revenues of around $100 billion, along with Tata Consultancy Services (TCS), one of the world’s leading IT services, consulting and business solutions organisations, are the title sponsor of the Tata Mumbai Marathon. Sport has always been an integral part of Tata for over 75 years. Tatas association with multiple sports ranging from cricket, football, hockey, badminton, chess, athletics, mountaineering and motor racing, among others, has produced many award-winning sportspersons, helped the development of marginal communities and supported sporting teams, national and international events as well as training academies. The Tata Sports Club was set up in 1937 to encourage sports among its employee base across the country.